Implement Metacritic reviews and MetaScores using IVA's Id's. A paid subscription to one of IVA's core solutions. Agree to the Terms of Service of use. Please note, Metacritic data is not available on Free Trial subscriptions. For more information, contact Sales. We will be in touch after we review your request. There are two endpoints to get reviews. One for Movies and another for Shows. Pass the IVA Movie or Show ID for the program and get back any related Metacritic reviews. Be sure to follow the branding guidlines below for displaying the scores and logos. Metacritic Trademark. When referred to in print only the “M” in Metacritic and Metascore must be capitalized, the remaining letters are in lower case (i.e. “Metacritic” and “Metascore”). Displaying Metascore with wordmark. Metascore with the Metacritic logo, wordmark and review count. Used in connection with a title (movie, game, show or album) on a 3rd party site or application. 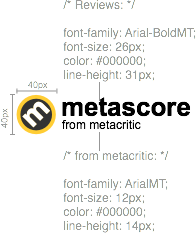 Displaying Metascore with wordmark (text only). Metascore with the Metacritic logo, wordmark and review count. Used in connection with a title (movie, game, show or album) on a 3rd party site or application. Styling of the phrases "metascore" and "Based on N critics" may be customized to match the styling of the 3rd party site or application. 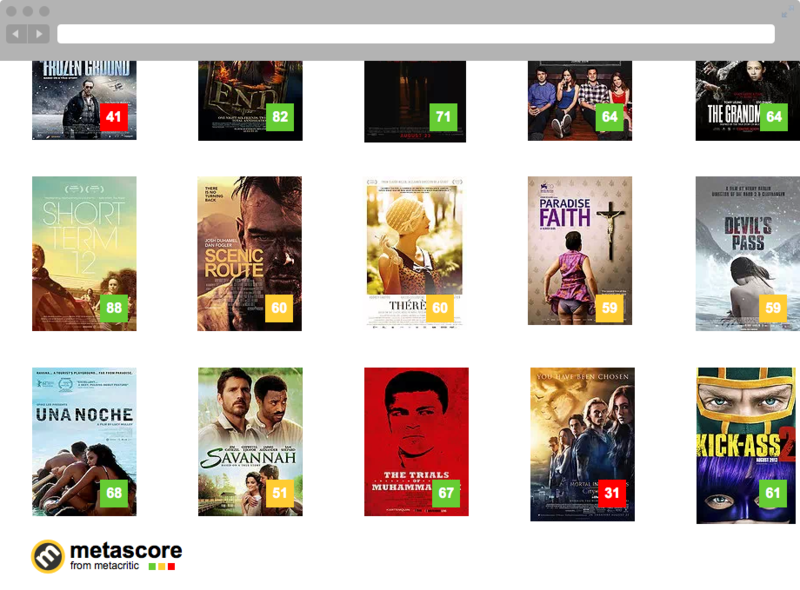 Displaying Metascore without wordmark or review count. 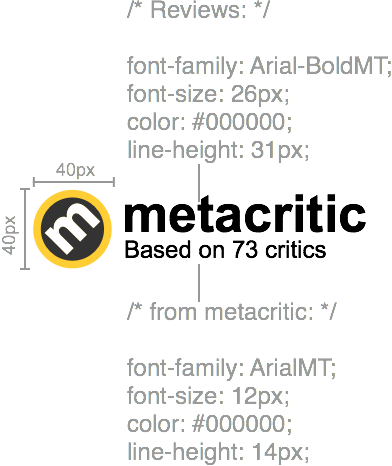 Metascore and the Metacritic Logo without wordmark or review count. Suitable for usage in mobile apps and other contexts with limited screen space. Displaying multiple Metascores. When multiple Metascores are displayed on a screen (e.g. search results page), it is not necessary to display the Metacritic Logo or wordmark next to each score. The Metascore badge (ex. 7 or 8) should be displayed on the same screen. Displaying Metascore badge. Used in conjunction with multiple Metascores and/or critic reviews. Displaying Metascore badge (text version). Text version of the Metascore badge used in conjunction with multiple Metascore and/or critic reviews. Styling of the phrases "metascore" and "from metacritic" may be customized to match the styling of the 3rd party site or application.